Galia Solomonoff is the founding principal of Solomonoff Architecture Studio (SAS), an award-winning design firm established in Chelsea in 2004. Since its inception, the firm has been dedicated to the integration of art and architecture. With artist Robert Irwin, Solomonoff and her previous firm, OpenOffice, converted a 1929 factory into Dia:Beacon, a daylight-only art museum in Beacon, New York. With FXCollaborative, Solomonoff is converting the 1899, Carrere & Hastings’ church at 361 Central Park West into a new home for the Children Museum of Manhattan (CMOM). Solomonoff currently teaches at the Graduate School of Architecture (GSAPP) at Columbia University and lectures on topics of Art, Public Housing and Latin American Architecture. Solomonoff has worked with over 40 artists, designing site specific, multi-media, permanent and temporary art exhibitions. Her architectural firm seeks to make art accessible to all publics. Solomonoff is married to artist Fabian Marcaccio and lives with her family in New York City. In her interview with Julia Gamolina, Galia speaks about precision, cultural context, and the business of architecture, advising those who want to start their own firms to leverage the resources and networks they have as students. GS: I decided I wanted to be an architect when I was about eight. I told my mom that I wanted to redesign our house [laughs]. My mom loved it – she thought it would be a really good path to pursue. A few years later, I thought I’d be an industrial designer instead because I liked machines and smaller things, but my mom argued that an architect would be better, because I could then design at all scales. In Argentina where I’m from, architecture, product design, and urban design were all one profession – there was no division. So, when I started studying, my interest ranged from the urban to ergonomics, and architecture was the focus. Where did you work before you started your own practice? I first worked for Rafael Vinoly, then for Pasanella and Klein, then Barnard Tschumi, and finally for Rem Koolhaas’ OMA. This was a total of five plus years, as some were summer jobs. The experience that marked me the most was OMA, in Rotterdam. Bernard Tschumi was a Columbia-centric group, whereas OMA had a challenging global team, and that was inspiring. However, the environment at OMA was very competitive and cut-throat, with high stakes. I felt demanded in an unsustainable way – it was hard to work there, in the 90s, for a long time. There was a quick and dynamic turn around - one got to one’s own limit and learned a lot in a short time. When I was at Columbia and studied with Ken Frampton, Jesse Reiser, and Greg Lynn, I thought innovation was in form and material and tectonics. But at OMA, I understood the cultural and the political dimensions doing architecture. In Rotterdam, we always considered urbanism and architecture together. Many times, we would be designing a building, but we’d be questioning the entire city and the politics of where we were working. I was working on IIT in Chicago, and the project was about 50,000 SF, but we were looking at the elevated train, and the Mies campus, and the neighborhood, Chicago’s South Side where our building was, and all the circumstances around it. There is no way that an office like that can be profitable, but there is also no way that you can get into that level of architectural intensity if you approach it from the point of view of billable hours. How did you navigate a competitive environment like that? In the course of a project, a situation arose that set me up to betray a colleague, another woman, as a part of the job. I did not and that forever set a limit and established a principle for me. In a non-collaborative environment, sometimes people are asked to cut in front of someone else. It is important to be prepared to stop negative cycles and set principles for oneself in the work place. This has a lot to do with why I now work on my own and how much I enjoy setting my own terms. Did you start your own practice following this experience? I first started a firm in 1999, OpenOffice, with partners Linda Talman, Alan Cook, and Lynn Rice. The idea was that we were going to be like a sports team, where people are free-agents and can come and go. But there are set structures that prevented that; one is the tax code, as one needs to define if one sets a professional corporation or a joint-venture – joint-venture is per project, so one has to set it up for each project, the other, a corporation is an entity where people belong, so one cannot be a free-agent. For architects as we are a regulated profession there is no such a thing as coming-and-going! Why and when did you then go off completely on your own, to establish Solomonoff Architecture Studio? In 2004. After 9/11 in 2001, two of my partners decided to move and live completely off the grid. Lynn and I continued with OpenOffice and completed Dia:Beacon and few other projects in 2003, but over time, our partnership weakened. We went our separate ways in 2004 and I decided to work on my own. In a way, the decision at first felt like a step down – no more business class travel for a while [laughs]. At first when you work for yourself, you buy your own ticket, make up your own bag, pack your own models. When I went off on my own, most of the work was residential, and everything became smaller, and financially difficult too. Over time the work has built back up and allowed me to do thing on my own terms, or more on my own terms [laughs]. It took me a while to get here, but I love my practice right now. The “smallness” accumulated and built up over time and allow for a freedom and the ability to shift in terms of scales and program, and to also incorporate teaching. In 2007, Galia was featured in New York Magazine as part of New York next wave of most promissing designers. Standing from left, Jean-Paul Viollet, Pepe López, Kyra Hartnett, Galia Solomonoff, Sara Story, Adrienne LaBelle, Roby Wynne, and Gal Nauer. On floor, from left, Benjamin Aranda, Amy Lau, and Billy Cotton. Would you say Dia:Beacon was one of the more formative projects for you? Yes, Dia:Beacon was extremely formative and extremely challenging – we had to work with every artist and accommodate every piece in a perfect way, in a fixed building. We had a 300,000-sf box to fit art content that required 500,000-sf, and we had a column grid that we could not afford to alter. The challenge was to organize the artwork to be in perfect rhythm with the structure with precision in every single space. In terms of what I learned – at Columbia, I was a solid student, top of my class, in a competitive class, the first woman to earn Columbia top design prize. At school, I was focused on the formal aspects of design. I understood form and tectonics and enjoyed the mathematical aspects of beauty and form. Then at OMA, I concentrated more on the, “What will the building do.” What is the cultural and political context of the building and how does the building change it? And then with Dia, I learned to work with artists, as a parallel entity to the client. My client was Dia, the museum and its trustees, but my peers and superiors were the artists, always, because they needed to allow my work to “frame” theirs. Tell me about your teaching and how it informs your practice as well. Teaching is also a very long-distance sport – I started teaching at RISD, in 1995. I went from RISD to Columbia, from Columbia to Cooper, from Cooper to Princeton, from Princeton to Yale, eventually back to Columbia, where I am now. In every place I learned something, and left something of my own behind. Teaching is quite inefficient [laughs] – it takes lot of energy - but teaching plays a very functional role in our profession, it trains us to give and take– it trains one’s eye to look at things and find what works and what doesn’t; it trains us to look for the unexpected, for new leads. A student may want to put all the stairs on the perimeter, and the trained teacher may feel the perimeter is needed for windows! Then 12 weeks later, one discovers a new approach. What I love about teaching is that with a given set of premises and some openness there is always someone that tries something that you did not see coming. Teaching to me is a way of investigating assumptions within our discipline and meeting people curious and attentive to new ways. You’re also a mom; tell me about this aspect of your life. Motherhood is 90% joy, 10% work at this point – my son is twelve. Having a child was the best decision ever and the best challenge I've faced. The first year is tough, as everyone knows, but I would say the most difficult time is between the ages of one and four, because by then, everyone expects you to have everything under control, when you really don’t [laughs]. After four years, our society is organized to take care of kids this age, so one can continue to live and work. And then after ten, motherhood is an intense dialogue to impart and imprint values and routines and helping make important decisions. It’s great – I love being a mother. What have been your other challenges? Overcoming the way I was brought up. I was brought up with the idea that gold shines by itself – that you don’t go out and say, “I’m great.” The reality of this profession though is that you do need to say, “Here are my talents, I can do this and that, I am the best for this or that project” and that has been tough for me. My challenges have been more on the side of my personality than on the complexity of the work to be done. Asserting and advocating for myself, setting expectations of price and budget, developing a viable business model for my firm has not been easy. Self-promotion and profitability are necessary in our culture and profession. These aspects are not natural to me; I had to learn them step by step. My favorite projects - whether it's Dia:Beacon, a townhouse for a family of art collectors,or artists, or work that I did for the Jewish Museum - are always about allowing for something specific and precise to occur. When something looks simple but it’s actually very precise and deliberate. My goal is to do nothing with maximum precision; to walk into a room and look until I know exactly what needs to be done - a very precise move that makes everything around work. I’m proudest of the work that I’ve done in connection with art, in museum and homes where people live. It’s been fifteen years. I now go back and change a home and a room that used to be for a baby, into a room for a college student, or we install a Modigliani in a place that was shaped for a totally different circumstance. You’ve worked a lot with artists, and you’re married to an artist. What have you learned about designing spaces for their work? People give great importance to comfort – to being comfortable. I love working with artists because they understand discomfort and they understand compromise, they make very strong choices that are not always geared towards practicality. And when I work with people that are in non-visual fields, it’s sometimes a struggle to communicate priorities [laughs], because for me, beauty is a priority and my priorities are rarely practical. Galia with her husband, artist, Fabian Marcaccio, in front of his artwork commissioned for Documenta X in 2002. What have you learned in general? I’ve done a lot of projects in these 14 years, and now I have a clear sense of how everything works - how the system works, how much things cost, where are the difficulties that I need to concentrate on, what are the things that junior people can do without my supervision, so I think what I’ve learned is how the entire machine of art and architecture work in the city of New York. If I was doing a cultural building in Paris, it would be challenging in a different way. It has been a slow learning curve, now I can do larger and more complex things, like the work I'm now doing with FXCollaborative - applying the knowledge I got and share it with a larger and more complex team to tackle larger issues, not just in size, but in terms of the complexity of the stake-holders. 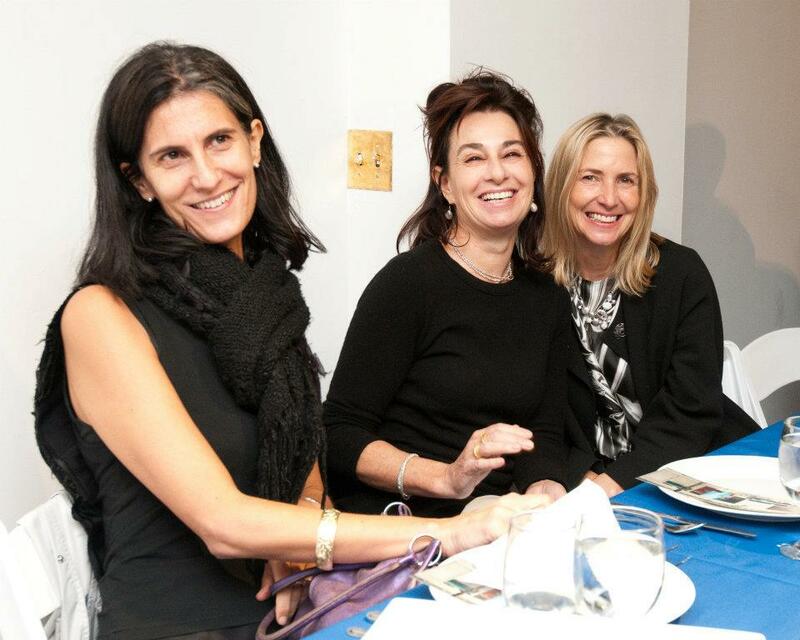 Galia with Claudia Gould, Director of the Jewish Museum and Lise Anne Couture at a Storefront For Architecture Fundraising event hosted by Eva Franch i Gilabert. At Eric Goldenberg's Pulsation Event at Studio X, NYC, with Bernard Tschumi (not in the picture) and Ferda Kolatan to Galia's right. What advice do you have for those starting their own firms? Don’t work from home. If you want somebody to invest in you, you have to invest in yourself first. Go off on your own, sign a lease, share an office, and project a sense of self-confidence so people understand how serious your work is for you. Especially for women – invest in yourself. For people that are starting their own firms, a lot of people don’t realize that you are much more powerful in your last year of school than you are the day after you graduate. My advice is that if you’re thinking of having your own firm, while you’re in graduate school, talk to your peers and start when you’re in your last year – not after. Use the resources and the network you have at school to launch. The drop in resources after you graduate is significant and a lot of people don’t see it coming. Finally, where are you in your career today? I’m focusing on doing bigger projects – bigger in terms of budget, program, complexity, and stakeholder investment. I’m trying to teach more in less time, and in general,I'm trying to be more efficient. Being the leader of a small firm requires administration of resources and time, so I want to reduce administrative time and expand design time. I’m always looking for the perfect routine – designing my life, if you will. Designing my day, my routine -what I do, eat, drink, exercise-, my office, so that I can continue to focus on architectural design and do it for a long time to come. 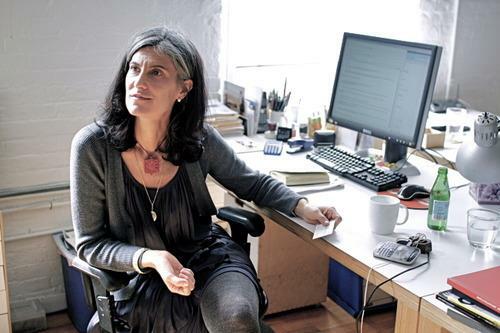 Galia at her Solomonoff Architecture Studio's desk, 2013.